Its main feature is the rotational movement of the bowl together with the spiral hook..which makes only on part of the dough to work while maintaining low friction heat and providing a more homogeneous mixture. Heavy-duty to meet the most demanding operations. Ease of Use :For observing and easy adding of ingredients without stopping mixer. Suitable for incorporating ingredients and mixing small batches. 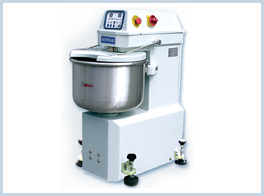 provides versatility and high production from a single unit..
Standard accessories: Bowl, Beater ,Whisk.